Rising above the glut of "me-too" game programs for the Atari home computers announced at the West Coast Computer Faire last spring is a self-improvement program called SpeedRead+. It is a serious attempt to help users boost their reading speed and comprehension by using well designed eye training exercises. The principle behind SpeedRead+ is a simple one. If you can train yourself to concentrate on reading text efficiently, you will save time, understand more of what you read, and feel less tired at the end of a long reading session. To help users achieve these goals, the publisher, Optimized Systems Software, provides a machine language program that flashes words and phrases on the TV screen at speeds from five to five thousand words per minute. Three literary classics are included as text files with the program: Washington Irving's "Rip Van Winkle" and "Legend of Sleepy Hollow," and Bret Harte's "Outcasts of Poker Flat." Each eye training exercise is accompanied by tips on how to use it to best advantage. Once an exercise is selected, the user can control both the display speed and the width of the text window by using either the keyboard or the Atari joystick--a nice touch. An option menu and display of the current reading rate are always just a keystroke away. SpeedRead+ starts by loading the text of your choice into memory, automatically using all the space available. It counts every word of text, so that you can start a session by specifying the very spot at which you left off last time. The words flash by on the screen, centered under a stationary dot that gives the eyes an anchor in the vast expanse of the video display. The idea is to hold your eyes steady, letting you absorb the information without backtracking or "tuning out." As you feel more confident with the exercise, you can select wider phrase modes (up to 38 characters, nearly the width of the Atari display) to broaden peripheral vision, or you can increase the display speed--or both. From here the alternatives vary, depending on individual needs. A "double phrase mode" displays text alternately on the left and right sides of the screen. This exercise trains your eyes to jump to a predetermined point and instantly recognize the phrases. It also develops the timing and rhythm necessary to read printed text efficiently. 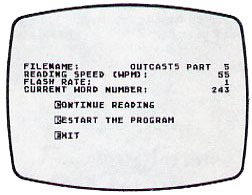 A "random phrase mode" displays text anywhere on the screen, although the user can select the approximate distance from the central stationary dot. The purpose of this mode is to expand peripheral vision, an essential element in speed reading. I found that it took some practice to keep my eyes glued to the dot and still comprehend the text flashing on the screen. The "column phrase mode" most closely approximates the kind of reading we all do once we tear ourselves away from the computer. This exercise trains the eyes to travel from top to bottom of a column of text, stopping only once per line and focusing at the center of each line. The program displays each column for a predetermined number of seconds, then replaces it with more text. By pulling forward or backward on the joystick, I was able to synchronize the speed so that the text changed just as my eyes hit the bottom line of the column. SpeedRead+ is an updated version of the old tachistoscope, a mechanical device that presents visual material for brief periods of time. During World War II, naval aircraft spotters were trained to differentiate friend from foe based on images flashed by tachistoscopes equipped with mechanical shutters. The technique was highly successful. But when they used the machine for character and word recognition, researchers found that average reading rate gains were unimpressive (though some people achieved spectacular gains). To this day the effectiveness of the tachistoscope is an item of controversy. Because SpeedRead+ is essentially a computerized tachistoscope, it must be evaluated with caution. The program makes no attempt to break the text into meaningful phrases; it simply calculates how many words it can display at a time and considers that a phrase. This hinders its ability to boost true phrase recognition and overall comprehension. While it would have been possible to mark appropriate phrases in the text (by setting the high-order bit of the first character as a flag, for example), this would have entailed a great deal of work, would have raised the cost of the software considerably, and would not have solved the problem of marking user-supplied text. There are other problems, too. For one thing, the three texts are supplied entirely in upper case. When was the last time you read a book printed in all capital letters? Author Zeissman claims that it is easier to recognize words when they are capitalized. I was taught just the opposite in college design classes. He may be right in the case of the Atari, however. Its lowercase character set is so--well, so whimsical--that it could interfere with rapid comprehension. The choice of texts puzzles me as well. While Bret Harte and Washington Irving are colorful authors, they hardly typify the standard fare of today's readers. Their styles and vocabularies are somewhat dated, and they appeal, I suspect, to a limited audience. I would have preferred to see the SpeedRead+ manual included on disk so that I could have absorbed it for practice. Once you have read Harte and Irving a few times, of course, you know every twist in the plots, and I found a tendency to let my mind wander when I should have been concentrating. The author has thoughtfully provided an explanation of how to create new text files using any Atari-compatible text editor (or the Assembler cartridge). A good way to acquire lots of text is to pull it in over the phone lines from a remote system like the Source or Compuserve. Along with SpeedRead+ and the text files, OSS includes the framework for an examination program that lets teachers prepare computerized multiple choice tests. The exam system, which includes automatic score keeping, is designed to check students' comprehension levels. Each exam may have up to 255 questions. The sample test is sketchy indeed, and I couldn't help wishing it had been based on "Outcasts of Poker Flat." a relatively unknown work to many students (and to me). It is probably asking too much of a teacher to make up a computerized exam for each text covered in class, but a school system with several Ataris might use the comprehension exams to advantage. I suspect SpeedRead+ will find its way into more homes than classrooms, since it is best used on a regular basis in a quiet place, rather than for a week or two at a time at school. I found SpeedRead+ a practical and useful tool. The morning paper has always been my nemesis; a careful reading takes as much as an hour a day. By using SpeedRead+ as an exerciser, I have raised my comprehension level (though without, alas, cutting my reading time). The improvement may be due to the constant reminders in the manual to concentrate while reading, rather than to any improvement in eye movement or phrase recognition. At any rate (pun intended), I am enjoying my reading more now, and I am convinced that SpeedRead+ has contributed to my pleasure. Keyboard commands can be initiated from Atari joystick controller. Optimized Systems Software provides an excellent 25-page manual that explains the theory behind each exercise, outlines sample exercise sessions, and gives simple start-up instructions for first-timers too impatient to read the whole manual. The two disks come with a strongly worded licensing agreement. OSS has an excellent reputation for support of its Atari operating system and Basic upgrades, and can be expected to stand behind this product. They do promise telephone support, though I was unable to find any significant bugs. There is a hint also of future updates at reduced rates (or no charge) to licensed users. OSS released the Apple disk version of SpeedRead+ in May, and they hope to have disk versions available soon for the TRS-80 and IBM PC. This program is a welcome reminder that home computers can be much more than game machines. I would like to see more personal development tools of this caliber. SpeedRead+ has much to recommend it, and I do so without hesitation. Bud Stolker, Landmark Towers, Apt. 1506, 101 S. Whiting St., Alexandria, VA 22304.